Warm welcome for the 250 men and women of the 1st Battalion - the Royal Anglian Regiment as they parade through Norwich. Troops from the 1st Battalion The Royal Anglian Regiment were reunited with their families as they returned from Afghanistan today. Troops from the 1st Battalion The Royal Anglian Regiment are returning to the UK from Afghanistan today. 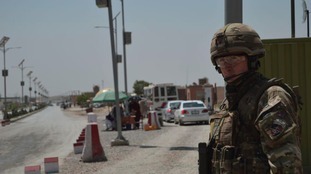 SOLDIERS from B (Suffolk) Company, 1st Battalion The Royal Anglian Regiment, are due to return to Bulford today (Sun 7th October 2012), after the Battlegroup's deployment in Helmand Province, Afghanistan. The Company were working to hand control of Helmand back to the Afghan National Security Forces. During the tour, Corporal Alex Guy was fatally wounded on Friday 15th June 2012. He was wounded when leading his section forward to assist a group of Afghan soldiers following an insurgent ambush.